Kind of a delayed post because last week-end was so full I didn't have time to write about it yet: I went to Dubai Singers Concert at Monarch Hotel. 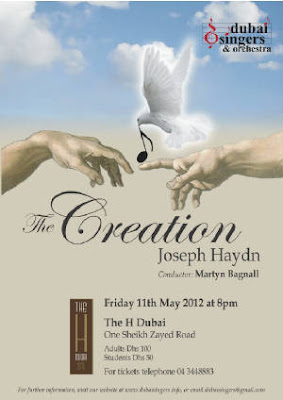 The performance was Joseph Haydn's The Creation, with Martyn Bagnall conducting, the Choir and 3 Soloists. If I am completely honest, I like Ballet more than the Opera. I need visual action, whether it's classical, modern, jazz... I am not fussy, I love it. With Operas, my attention tends to vanish after an hour: for some reason, I have a one hour resistance to classical singing. The only one that gets my full attention from beginning until the end is Mozart's Magic Flute, and I absolutely cannot explain why. But it proves I can actually do it so I keep on trying and learning more about it. Practice makes perfect! And it was so nice to get a little bit of Culture in Dubai. I will definitively watch out for the Dubai Singers next performance! To learn more about Dubai Singers, click here.